Audie Award Winner, Solo Narration - Male, 2014 Audie Award Winner, Literary Fiction, 2014 The author of the classic best-sellers The Secret History and The Little Friend returns with a brilliant, highly anticipated new novel. 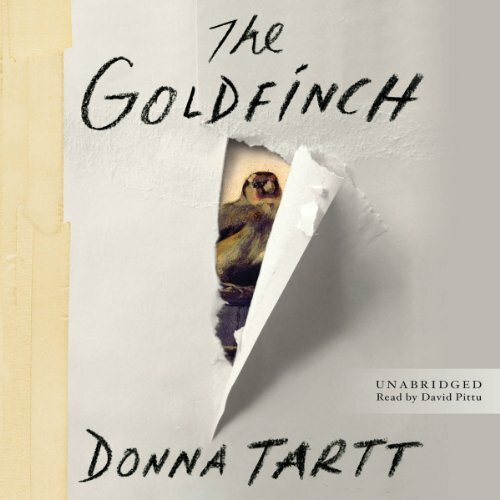 Composed with the skills of a master, The Goldfinch is a haunted odyssey through present-day America and a drama of enthralling force and acuity. It begins with a boy. Theo Decker, a 13-year-old New Yorker, miraculously survives an accident that kills his mother. Abandoned by his father, Theo is taken in by the family of a wealthy friend. Bewildered by his strange new home on Park Avenue, disturbed by schoolmates who don't know how to talk to him, and tormented above all by his unbearable longing for his mother, he clings to one thing that reminds him of her: a small, mysteriously captivating painting that ultimately draws Theo into the underworld of art. As an adult, Theo moves silkily between the drawing rooms of the rich and the dusty labyrinth of an antiques store where he works. He is alienated and in love - and at the center of a narrowing, ever-more-dangerous circle. The Goldfinch is a novel of shocking narrative energy and power. It combines unforgettably vivid characters, mesmerizing language, and breathtaking suspense, while plumbing with a philosopher's calm the deepest mysteries of love, identity, and art. It is a beautiful, stay-up-all-night and tell-all-your-friends triumph, an old-fashioned story of loss and obsession, survival and self-invention, and the ruthless machinations of fate.